Today marks the 100th anniversary of the Boston Molasses Disaster. 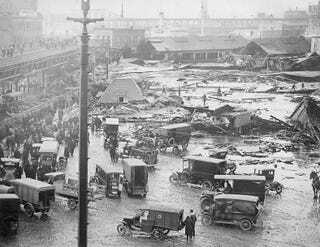 On January 15th, 1919, a 2.3 million gallon tank of molasses ruptured, sending a tsunami of molasses at 35 miles per hour into Boston, resulting in 21 deaths, 150 injuries, and $100 million (in today’s dollars) in damages. The causes are believed to be poor tank construction and warm weather that resulted in the tank’s failure. The area also ended up smelling of molasses for decades to follow.